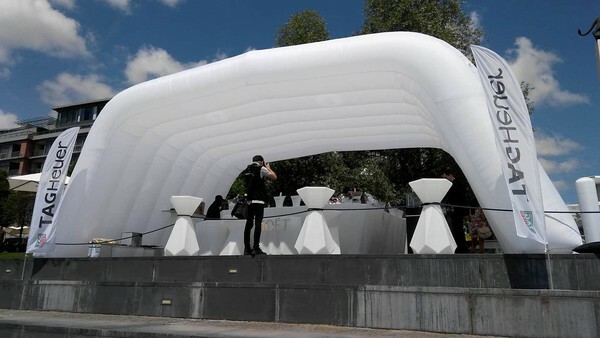 Inflatable tent/roof with unique and clever design for outdoor use in size 10 x 5 x 4m and white colour. :::USED but still in GREAT condition::: This structure is very dynamic shelter with large covered area. This is the ideal for corporate events, parties, exhibitions, promotions or weddings and it can also be used as a stage cover for outdoor events or CHRISTMAS events. In size 10x5m providing space for 80 people. It can also hold approximately 5 tables with a maximum of 60 seated guests if set up in a restaurant configuration. Comes with white back wall and two internal blowers. Delivery can be arranged. Delivery can be arranged by courier.